September 5 - Oscar Pistorius anchored the South African 4x100 metres relay team to gold in a T42-46 world record of 41.78sec here tonight before apologising once again for the timing of the comments in the wake of his 200m defeat which had created "a real backlash". But the man (pictured above, left) who has earned the distinction of becoming a track and field Olympian as well as Paralympian defended the position he had voiced in challenging the length of prosthetic blades worn by the Brazilian who beat him, Alan Oliveira, and insisted that the sport had to find a more consistent method of measurements if it was to thrive. 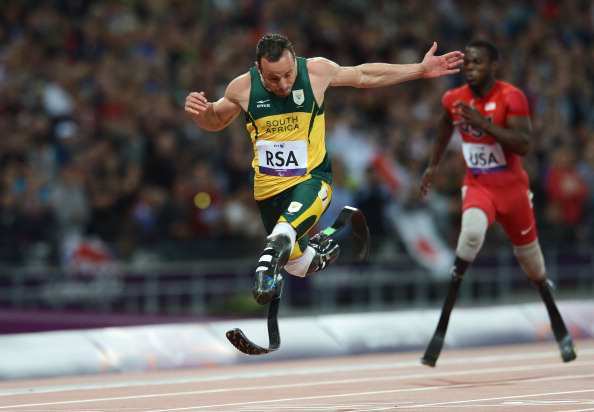 Pistorius made it clear, however, that he would not have chosen to change to taller blades himself before the Paralympics, as Oliveira did, had he not been obliged to stay with the blades on which he has been operating since 2004, which had been cleared for Olympic competition by the Court of Arbitration for Sport (CAS). When asked if he would have switched if he could, he responded: "Not at all," adding, "I've got a team mate in Arnu Fourie, and if I beat him on the day I want to know I've beaten him by hard work and talent." "I don't think every blade should be the same height, but I think it should be in relation to your body. "For the sport to evolve and be taken seriously it has to happen. Reflecting upon his reaction on Sunday night, he said: "I took a look at my silver medal and it's actually pretty beautiful. "Obviously I regret the timing of my comments after the 200m wasn't great and its led to a real backlash in the last two days. "It's easy to be gracious when you win, it not as easy to be humble when you lose, and I've had to learn that. "I think it was just frustration in the heat of the moment, and I have apologised to Alan. But I think it is a problem and the national Paralympic committee has brought it up with the IPC (International Paralympic Committee). "I was the first to bring up the topic, but a lot of other athletes have spoken about it in the last two days and I think it just shows that it is a huge concern and it has been in the sport for a long time. Among those who had spoken about the issue earlier in the evening was Jerome Singleton, who inflicted Pistorius's first defeat in seven years when he beat him to last year's world 100m title. 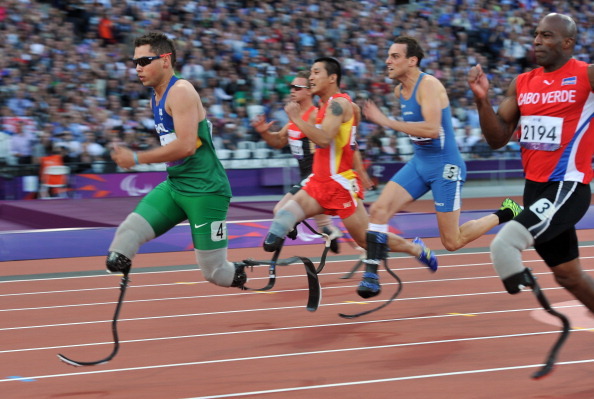 The American, a single leg amputee, made out his own case for separate racing rather than competing with double leg amputees – but he supported the comments Pistorius had made about the need for more precise rules on blade length, and added that some athletes were changing blades between the 200 and 100 metres racing. "It does happen," Pistorius said. "There is a problem, and it's got to be addressed." 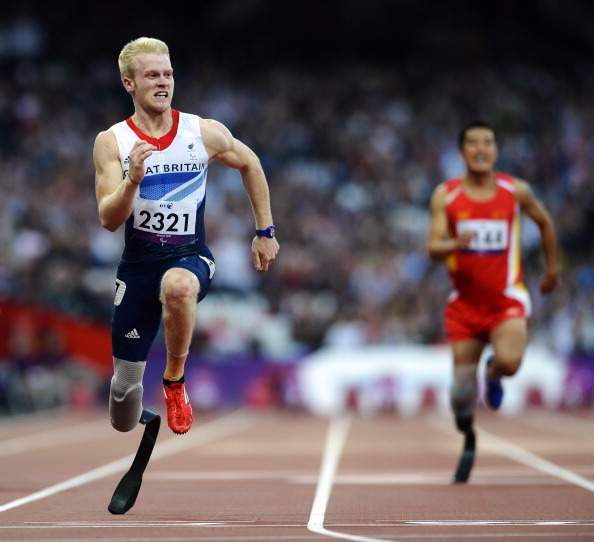 Singleton widened the debate on blade classification as he insisted that his T44 class – for single-leg amputees below the knee – should run separately from the T43 class, for double below-knee amputees such as Pistorius, a situation he likened to "apples and oranges". 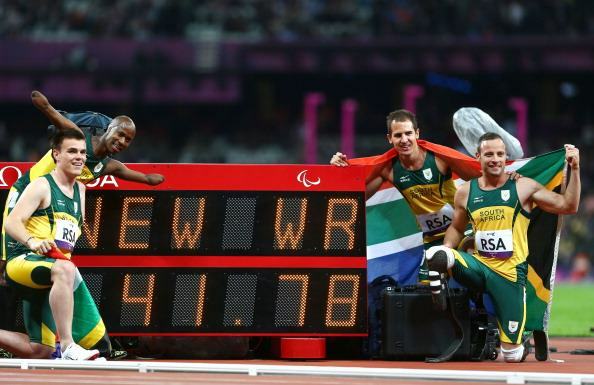 But Singleton also maintained that there was a groundswell of support for the South African's complaint about double amputees adopting taller blades, as Oliveira did a month before beating Pistorius in Sunday night's 200m final. Speaking after finishing as sixth fastest qualifier for tomorrow night's T43/44 final, where Britain's world record holder Jonnie Peacock was fastest with a Paralympics record of 11.08 ahead of Pistorius, who clocked 11.18, Singleton commented: "I think that the time has come that the T44s and the T43s have to split their classes. "Unless we can split the classes I think we need to review or evaluate that formula. "A number of athletes have made their feelings known to the IPC that we should make sure we have a formula where there is a leeway of between one or two centimetres, because no one wants to go out there and race someone totally different. "We need to have an exact height for an athlete to run in, so you know you are racing the same athlete in all competitions." Singleton, who has degrees in applied physics and industrial engineering and who has worked as a researcher at NASA, added: "As time changes, science changes too, so we just have to be sure it is fair to all competitors. "Right now it's like comparing apples to oranges, but not apples to apples. "It's not that this wasn't brought up earlier. "We brought this up with the IPC a long time ago. "It's just that we had to come to this point where we got to the Games where it was known by everbody." He commented further: "We have very little leeway in terms of what we can do. "If we want to advance the sport, we don't want to have a problem with someone breaking the world record and not even being on the podium." The 26-year-old from Greenwood, Carolina, added that many athletes backed the issue raised by Pistorius in the wake of his 200m defeat by Oliveira. 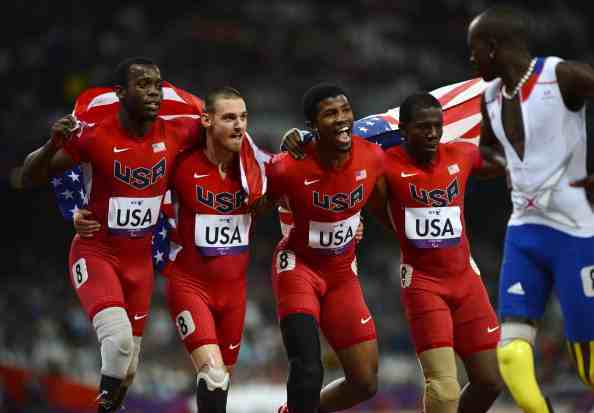 "I think that last night after the 200m final was over, a lot of people do support Oscar," he said. Oliveira, who reached the final as one of the fastest losers with a time of 11.56, commented afterwards: "I have only trained for the 200 metres, and that has been my main target here. "I know that this is Jonnie's big event, and it will be difficult for me in the final." Peacock, who set the world record of 10.85 while competing as a guest in July's United States' trials, breezed through afterwards, commenting: "It was a bad wind, a big wind tonight. "I'll be a bit quicker in the final."